I've been meaning to post about my new hair style for a couple of days, but I'm in production for the May issue ... and that has taken over my life. 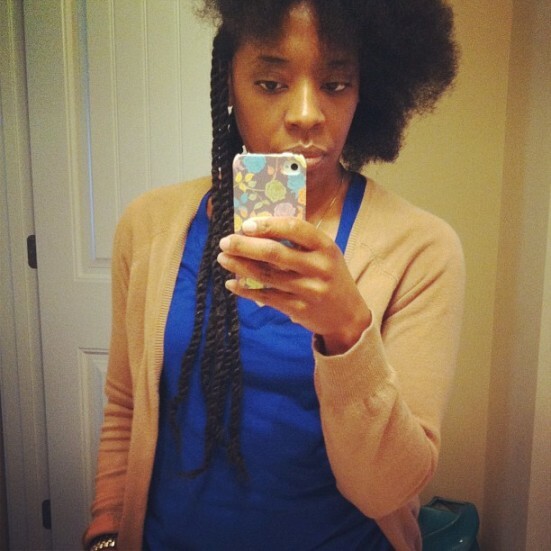 But, here I am today to give you a few quick deets about how I did my own Havana Twists. I saw a photo of Brandy last week with Havana Twists and loved them so much that I immediately wanted the style. So, I googled "Havana Twists" to see some other styles people were wearing but one of the first links to come up was a DIY video on YouTube by donedo05. She made it look so easy that I thought I'd try it. I'm not very handy with my hair; if you've been following me — you know I tend to stick to fros, twist outs and puffs. But, I actually made it through doing these twists, so that means virtually anyone can do it. One tip that helped me to get them started with invisible roots is to begin them like senegalese twists. I wish I lived closer so you could hook mine up! LOL. Gorgeous! I may take a stab at that in the summer. Thank you girl. Yes, you should do it. Just give yourself a couple of days when you're not feeling pressed by any other obligation. No sweat. So impressed; what a (beautiful) feat! But, here is the thing. I don't know how to do Senegalese twists, either. I need a moment. *sigh* P.S. Love this look on you! Thank you!! Now, go on over to youtube and post up in front of the mirror and practice. So cute! I must try this!!! You should! I loved the style.